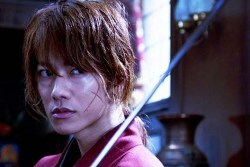 After rumors became solid fact, fans of the red haired samurai with the cross-shaped scar are waiting on tenterhooks for the release of the live action version of Rurouni Kenshin which will be shown on August 25, 2012. Rurouni Kenshin or Samurai X, is a manga-turned-anime about a gentle samurai named Kenshin Himura who constantly atones for his sin of murder back when he was an assassin known as Hitokiri Battousai or Battousai the Slasher. The cast of the live action was slowly unveiled and much to the delight of the fans, the cast are Japanese. Takeru Sato who is known for his role in Kamen Rider Den-O, takes the role of Kenshin Himura. Emi Takei, Aoki Munetaka, Yu Aoi and Taketo Tanaka make up the rest of the main characters as Kaoru Kamiya, Sanosuke Sagara, Megumi Takani and Yahiko Myojin. Yosuke Eguchi takes on the role of Saito Hajime, the captain of the Shinsengumi. Two of the villains from the manga and anime will make an appearance in the live action film as well. Koji Kikkawa will play the role of Jine Udo while another familiar villain named Kanryu Takeda will be played by Kagawa Teruyuki. As more photos and videos are spread throught the internet, the excitement of the fans escalate. It won’t be long before the Rurouni Kenshin live action movie will be showing in theatres worldwide.